So it’s February and I haven’t posted since, oh, I don’t know, December? Yeah. I win the flaky blogger of the month/year/decade award. I have this superpower where I just kind of fall off the radar for a while. It’s completely unintentional. I think when you are naturally a loner even a simple blog post is being too social. I’ve been doin’ stuff though! Check this sweet guitar I painted out! I got the old mexican made fender from my friend Cody. 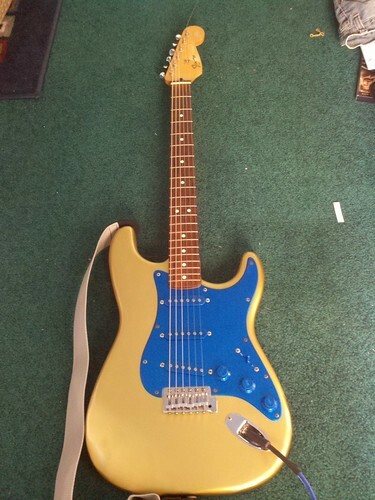 It was a bit beat up, which made it the perfect candidate for my first guitar re-haul project. So I sanded it down. And I say, “ROCK AND ROOOOLLLLLLL!” But seriously, I’ve wanted a gold guitar since I fell in love with The Band watching The Last Waltz. Robbie Robertson played this shiny gold and black guitar and I thought that was awesome. But being me, I couldn’t copy it straight, I had to do it my way and I really like that color blue. To cap off my geekiness I altered the headstock. 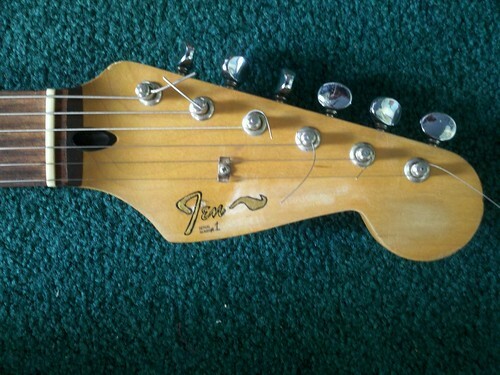 The Fender F is a lot like the way I sign my J’s and I just couldn’t resist. So there you go. That was my big project for January to keep me away from the interwebs. And it worked. Perhaps a little too well. Next I’m working on a Gibson Les Paul style guitar kit. 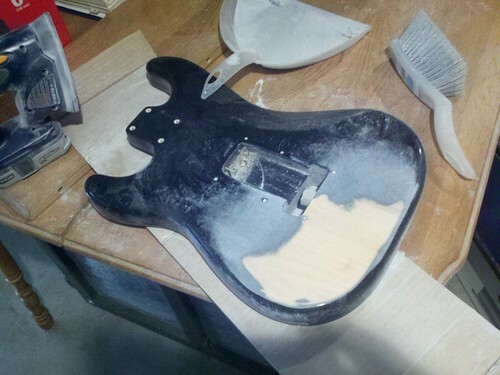 The thing comes with the wiring complete but the body and neck of the guitar unfinished. All you have to do is figure out how to make the body beautiful and stick it together. I’ve decided to go for a subtle steam punk look which I haven’t ironed out yet. I’m really excited to hammer out the style and design but first I need to do this revising my book thing. *sigh* my life is so hard. So yesterday they were down at Union Station for the KC Maker Faire. I love Make Magazine, its in my RSS feed, and I read it everyday but somehow I missed that this weekend was the Maker Faire in KC. It was a lot of fun. Tons of different kinds of projects and groups were showing their creations. My favorites were all of the 3D printers. I really wish I had the need for a 3D printer for prototypes but alas I’m not a mad scientist yet. Soooooon, but not yet. And yesterday I took another step toward scientific villany, or heroism. I learned how to solder! Soo awesome, and really easy! Now I’ve just got to spend some quality time with my electronics kit so I know what I’m doing. The comic you see in the corner of the picture was an incredibly helpful and informative how-to for beginner solderers. I found it online at MightyOhm. One thing I adore about the maker culture is the general desire of makers to help everyone around them hack their world. It’s a good thing. Check it out! The last couple of days have been project time for my dad and me. We finally cleaned out part of the unfinished section of our basement and have started setting up a nice little workshop. I’ve always loved making things, I just usually don’t have the equipment/space/money/time to do a whole lot. Well, I guess I have the time, but I do try and finish the important things first. i.e. the second Mercator book. The space is perfect, it even has a garage door to wheel in and out ambitious future projects. (I have my eyes on our aging riding lawnmower.) I’ve even used the space before for cool projects. Back in 6th grade we were required to come up with a project for our Egyptian History unit and I built a four foot tall sarcophagus with a mummy and scepters painted gold with researched hieroglyphics and everything. I had a lot of help, but I had a blast. Needless to say, I aced it. I even made the local paper with the project. I wasn’t trying to over achieve, I just thought it’d be fun. Yesterday we cleaned out all the junk, re-organized, got rid of cobwebs, and swept out the mouse poop. Today we bought a nice heavy vice and grinder and mounted them with bolts on the work table. There is still a lot to do, but it’s a nice start. Soon we’ll have all our tools organized and join the table to the wall for stability and with a little extra lighting we’ll be in business! I’m not a train nerd, but this video of replacing tracks is pretty darn awesome. I’d love to see a resurgence of train use in the US. Perhaps in the post oil days we’ll rediscover how awesome rail travel can be. I know that while I went to school in Wheaton, one of my favorite things about living near Chicago was the light rail system. It might take a few extra minutes to get downtown, but you didn’t have to mess with traffic, and you could zone out and just enjoy the ride or get some work done. Welcome to the future where we live in pods on the top of buildings. I think it’s a great idea, I’ve always wanted to live on a space station. But where would I keep my books? The more I art, the more I realize that all art is in some way derivative. Like the Bible says, “There is nothing new underneath the sun.” It’s not nearly as depressing as you think. The way a great artist steals you might not even recognize what it was they stole. It may be an idea or just an element from the work of another artist, and it’s usually re-purposed and twisted into something shiny and new that has little resemblance to the original. Think of it more as recycling. If you know who the artist/author lists as their influences then you might be able to see the stolen bits. Art builds on what came before just like science, engineering, and everything else. Now if you’ll excuse me I’ve got to go hack out a lung and get to writing. Found this while surfing the interwebs. Let me see, how do I put this? 4. Do I even need another reason?